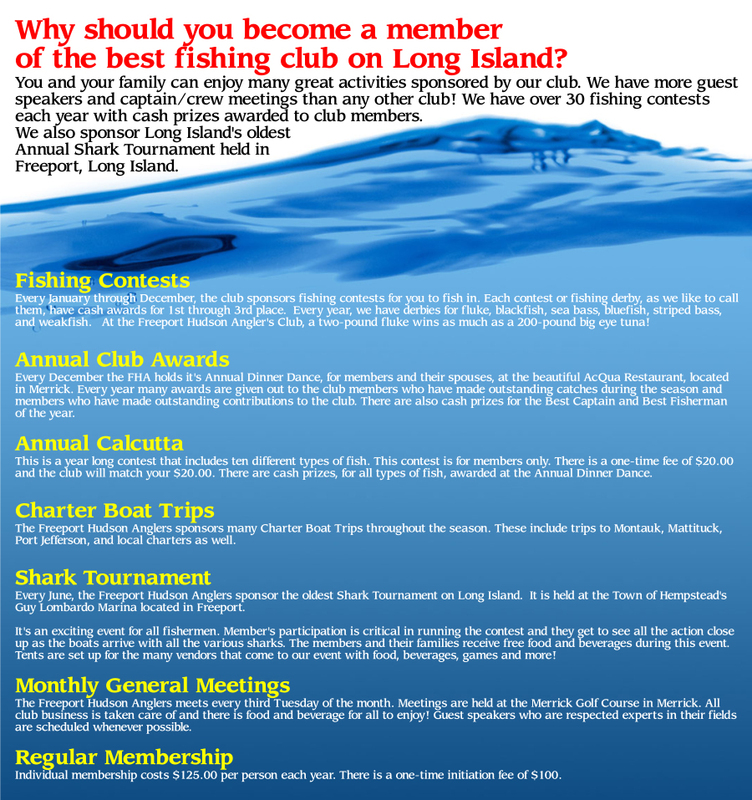 Why should you become a member of the best fishing club on Long Island? You and your family can enjoy many great activities sponsored by our club. We have more guest speakers and captain/crew meetings than any other club! We have over 30 fishing contests each year with cash prizes awarded to club members. We also sponsor Long Island's oldest Annual Shark Tournament held in Freeport, Long Island. Fishing Contests: Every January through December, the club sponsors fishing contests for you to fish in. Each contest or fishing derby, as we like to call them, have cash awards for 1st through 3rd place. Every year, we have derbies for fluke, blackfish, sea bass, bluefish, striped bass, and weakfish. At the Freeport Hudson Angler's Club, a two-pound fluke wins as much as a 200-pound big eye tuna! Annual Club Awards: Every December the FHA holds it's Annual Dinner Dance, for members and their spouses, at the beautiful AcQua Restaurant, located in Merrick. Every year many awards are given out to the club members who have made outstanding catches during the season and members who have made outstanding contributions to the club. There are also cash prizes for the Best Captain and Best Fisherman of the year. Annual Calcutta: This is a year long contest that includes ten different types of fish. This contest is for members only. There is a one-time fee of $20.00 and the club will match your $20.00. There are cash prizes, for all types of fish, awarded at the Annual Dinner Dance. Charter Boat Trips: The Freeport Hudson Anglers sponsors many Charter Boat Trips throughout the season. These include trips to Montauk, Mattituck, Port Jefferson, and local charters as well. Shark Tournament: Every June, the Freeport Hudson Anglers sponsor the oldest Shark Tournament on Long Island. It is held at the Town of Hempstead's Guy Lombardo Marina located in Freeport. It's an exciting event for all fishermen. Member's participation is critical in running the contest and they get to see all the action close up as the boats arrive with all the various sharks. The members and their families receive free food and beverages during this event. Tents are set up for the many vendors that come to our event with food, beverages, games and more! Monthly General Meetings: The Freeport Hudson Anglers meets every third Tuesday of the month. Meetings are held at the Merrick Golf Course in Merrick. All club business is taken care of and there is food and beverage for all to enjoy! Guest speakers who are respected experts in their fields are scheduled whenever possible. 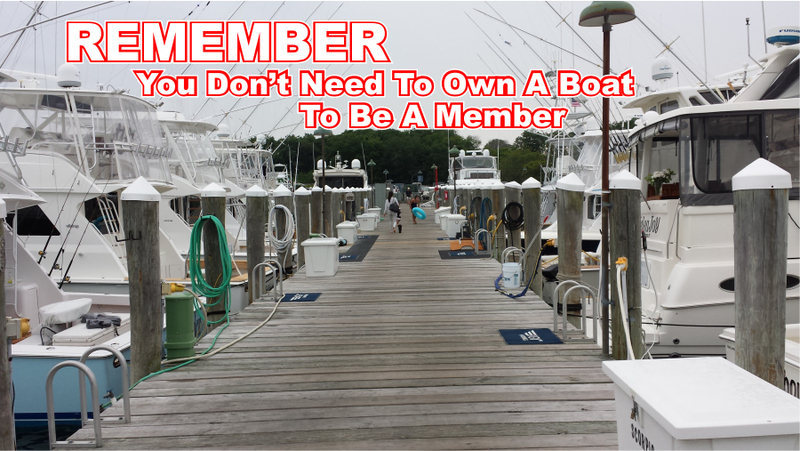 Regular Membership: Individual membership costs $125.00 per person each year. There is a one-time initiation fee of $100.